I have long been a huge fan of the original 1933 King Kong, and while admittedly it is a bit of a bloated mess, I even enjoyed Peter Jackson’s take on the story. 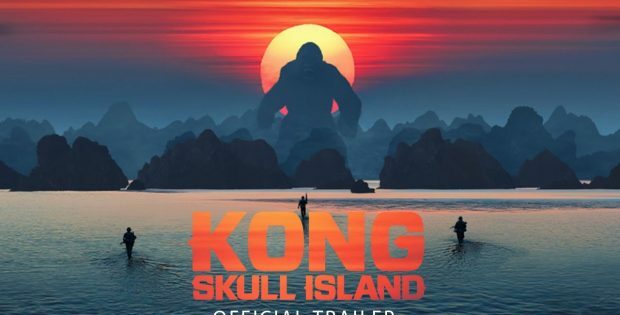 However, when the trailer for Kong: Skull Island was released it seemed little more than a silly monster movie, and I was still bitter from the mess that was the 2014 Godzilla. That said, I was still looking forward to sitting down and reviewing this film if only for the cast. Kong opens during WW2 when both an American and Japanese pilot crash land on a seemingly deserted island. I couldn’t help but think of John Boorman’s Hell in the Pacific and it made me smile. However, this island is far from deserted and the two men instantly stop their fighting when King Kong interrupts them. Cut to 1973 where Bill Randa (John Goodman) convinces a senator to fund his trip to a recently discovered uncharted island. So Randa puts together an exhibition team. We start with Lieutenant Colonel Packard (Samuel L. Jackson), and his men. Packard is about to be sent home from Vietnam, but it’s obvious all he knows his fighting. So he’s glad to take on another mission, even if his men aren’t. Then there is James Conrad (Tom Hiddleston) a former British Special Air Service Captain who is a master tracker, Randa offers him enough money to take the job. Rounding out the core team is Mason Weaver (Brie Larson) a photojournalist who thinks there is more to the story than anyone is letting on. The crew arrive at Skull Island and begin setting of seismic charges to map out under the island. This upsets King Kong who shows up and takes out all the helicopters in what is easily the greatest moment of the movie. And here in lies the films biggest problem – it peaks too early. That’s not to say the rest of the film isn’t fun, but none of it ever lives up to that moment. From there on out things get really crazy as the survivors of the Kong attack learn more about the island. Conrad’s goal is to get the civilians to the meeting point which is on the north end of the island. They have three days together. Packard (in a Captain Ahab like obsession) decides he needs to kill Kong for killing a bunch of his men in the helicopter attack. So like all these movies, the film ends up not only being about the characters trying to survive all the crazy monsters, but trying to survive the crazy human’s as well. There are quickly characters you want to see live and characters you want to see die. The team behind creating the monstrous creatures seen on Skull Island obviously had a lot of fun coming up with their creations, and for the most part they work. The one that fell flat for me were the lizard like creatures dubbed skullcrawlers by John C Reilly’s character. I don’t want to tell you who he plays as it’s a fun reveal. The skullcrawlers are the big rival to King Kong and their design is kind of lame. I was hoping for something a little more dynamic for Kong’s final big monster throw down. But at the end of the day, this was a King Kong movie, this was a giant monster movie, so what do you expect to get from it. Frankly, it had a lot more character development than I expected it to have and you actually cared about what happened to some of these characters. There are many derivative moments throughout the film, but they are done so well that you don’t really care. Kong: Skull Island is a fun movie that is certainly elevated by the top notch cast they were able to put together. Previous to this film director Jordan Vogt-Roberts had only directed an indie coming of age story, The Kings Of Summer. To see how well he handled this big budget film makes me excited to see what he’s going to do next. The film is presented in 2.4:1 and Dolby DTS-HD MA 5.1 Surround sound. This is a great looking and sounding film. The big moments and the quite dialog moments are mixed together very well. You can’t go into a King Kong movie expecting much more than a giant monster movie. And on that level Kong: Skull Island delivers. It is a very fun movie. The cast is great and they play a bunch of really engaging characters for this kind of movie. Warner Bros. presents Kong: Skull Island. Written by Dan Gilroy, Max Borenstein and Derek Connoly. Story by John Gatins. Based on King Kong by Merian C. Cooper and Edgar Wallace. Directed by Jordan Vogt-Roberts. Starring: Tom Hiddleston, Samuel L. Jackson, John Goodman, Brie Larson and John C. Reilly. Running time: 118 min. Rating: PG-13. Released on Blu-Ray: July 18, 2017.